He's still not 100% right but he is getting better. The constant whining is at a minimum, as is the requirement for our attention at all times (depending on the situation, and his mood, and what side of the bed he's woken up on, and his preference for mummy or daddy at that point in time, and whether blueberries should be on his spoon with or without rice bubbles, and whether there is juice in the fridge, and whether there is enough paste on his toothbrush - that's all). We went to playgroup on Tuesday morning and he vacillated between being ultra clingy to incredably independent. I find it particularly hard when he's this way, especially when I'm chopping fruit in the kitchen for shared morning tea and he's scrunched up between by legs and the bench demanding cuddles. My hands are all dirty, and even the bubbly Activities Coordinator couldn't pry him away with a balloon! Next minute he's supper fun and jumping all around. His imagination has just taken off as of late. He was pretending that thing (I don't know what it is - looks like a steering wheel with a handle) was a helicopter. He said "helicopter take off. I flying helicopter" and made noises like "der-der-der-der-der" and he "flew" it around in the air. Then he said "helicopter landing!" and decended it to the ground. Jef is making a RC tricopter at the moment, and he assembled a frame (some pipes joined together) for Kien. Kien loves it - his very own tricopter heli. He carries that and one of our old RC transmitters around and would pretend he was flying his tricopter. We hear him chirping "I fly tricopter heli. der-der-der-der-der. Up and down. Be careful. Don't crash. I landing tricopter heli now. der-der-der-der-der-der." The napping situation - it's hit and miss these days for us althrough he will still nap at daycare every day. So if we want him to nap we either take him out for a walk in the stroller or go for a drive. On Tuesday afternoon we met up with Mum, Rod, Michelle and Thomas at Limon for spanish tapas and sangria. 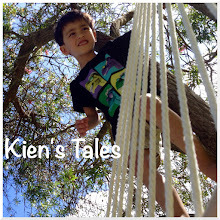 Kien stirred several times, crossed his legs and went back to sleep for a while longer as we enjoyed the afternoon sun. Rod had his hands full entertaining both kids. Here he is supervising them sharing snacks. We walked home via Wynyard Quarter, and Kien was so happy to run up and down the astro turf covered mound. We got home, and all he wanted to eat for dinner was yoghurt - or so I thought - until I turned around to find the boy rubbing it through his hair. Argh. He just loves to make work for me! But then he can look so innocent it melts my heart. A lovely post. Those early years sure can be challenging, but they do settle really quickly too.